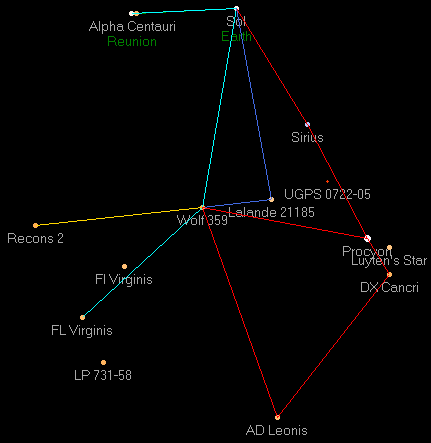 Wolf 359 (CN Leonis, GJ 406) â€“ Singular red dwarf (M6.5V) and one of the closest stars to Earth; Wolf 359 is 7.78 light years from Sol in the constellation of Leo. It has less than 10 percent of Sol's mass and is a UV-Ceti-type flare star. It may be hazardous to unshielded spacecraft during flare events. It is primarily known as a waystation to a number of colonization arms, particularly the International Ring. Significant mining activity takes place on a number of asteroids whose orbits take them close to the Sol wormhole. It has seven planets of note, all small rocky or icy bodies. Thales orbits in the leading Trojan point of Pittacus. Wolf 359 was disovered in 1917, and the wormhole from Sol was the first opened by the United Nations Space Agency in 2078. 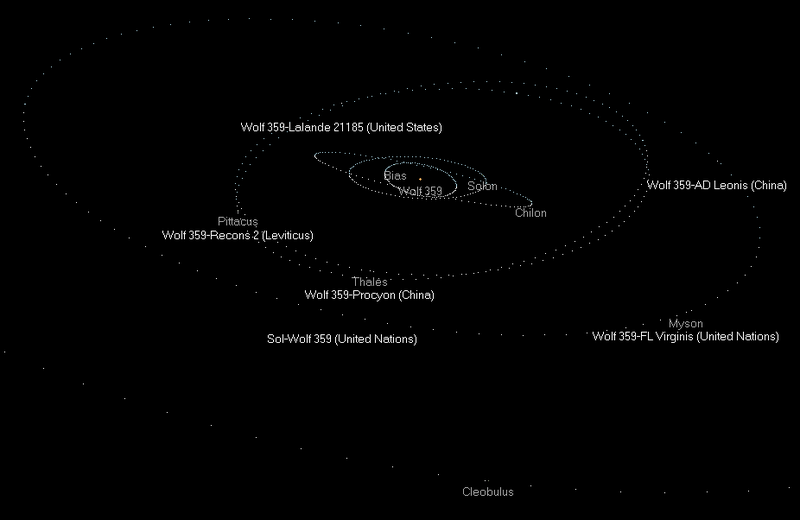 The Sol side is located in the Earth-Moon L-4 point; the Wolf 359 side is in the trailing Trojan point of the planet Myson. The USS San Jacinto transits Wolf 359 in July 2139. Her crew sights several Chinese colony transports that will involved in a battle in FL Virginis.